Luggage Restrictions: only small carry bags with a maximum 5kg. NO large backpacks or suitcases permitted. Upgrades to Double/Twin rooms can be arranged and are subject to availability. Due to the length of our tours we do not allow infants/children under the age of 4 years. We do not recommend the tour for passengers between 4 and 12 years, but should you wish to bring them on tour, they pay full adult price and you MUST stay in upgraded accommodation - not shared facilities. Departs Mondays, Wednesdays and Fridays at 7.15am. We pick up from selected hotels and hostels in inner city Melbourne and St Kilda. Please contact us at least 24 hours prior to departure using the details provided on your booking confirmation to confirm pick up location. This two day tour will leave you wondering how all this natural beauty & experiences can be packed into two days. The Great Ocean Road is one of the most beautiful ocean drives in the world. As you travel along the 243 kilometres, you have the Great Southern Ocean lapping the coast line on one side and on the other it is bound by national parks. The star of the show is the Twelve Apostles, and they do not disappoint. You will see these amazing limestone stacks from the lookout as well as from the beach. You will be able to walk down The Gibson’s Steps (86 steps) to see the 12 Apostles from ground level and realize just how tall they are. Make sure you get creative with your photos from this angle! We also stop at Loch Ard Gorge, many people find this work of nature as beautiful, if not more so, than the Twelve Apostles. You won’t be able to tear yourself away from the colours of the gorge and watching the waves come and go. The next wonderful place we visit is the Otway National Park where there is time to walk through this amazing old rainforest. The sights and smells will revitalize you. 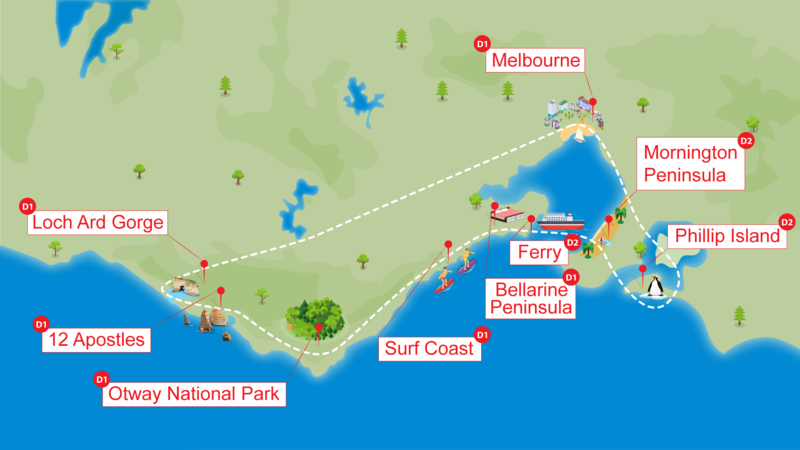 As we head to our overnight stop at the Beacon Resort, you will pass the beaches of what is known as the Surf Coast.